On July 7, the Head of Policy Administration for the Ministry of Education, Na Hyang-wook, has been receiving a wide range of criticism from the Korean public. This discontent stems from the comments he had made during a meeting with a number of reporters. When asked on what he thought about the current social system in Korea, Na said that he believed “the social hierarchy in Korea should be strengthened.” He made matters worse by comparing the public to “dogs and pigs.” Needless to say, his comments raised a firestorm, particularly as this high ranking public official was in charge of the nation’s education policies. Na’s careless comments reveal the blatant disconnect between the government administration and the people. 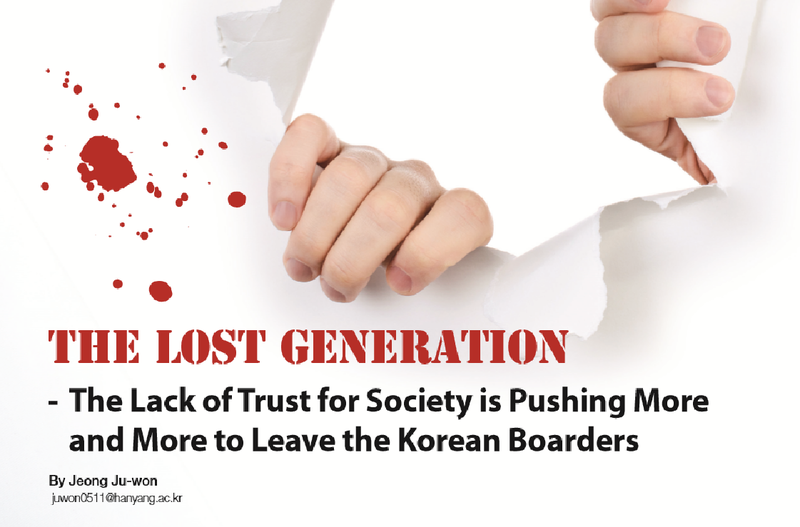 Due to growing perceptions of mounting problems in Korea, including concerns about finances, young people are starting to realize that their lives outside of the Korean boarders might be a possible alternative in their near future. Seeking the way to label the angst and frustration felt by today’s youth, a popular phrase has emerged which is the so called Spoon Theory. The spoon theory describes how a person’s lot in life is predetermined by his or her’s parents financial status. In other words, a person bore to rich parents, will likely be wealthy and financially secure for the rest of his or her life There are different spoons a person can be born with; diamond-gold-silver-bronze and dirt. The spoon theory idea grew in popularity as more frustrated members of the public sought consolation. According to a recent study by the Korean Institute for Health and Social Affairs, there is statistical evidence to support the spoon theory The study found that if a child is born from financially wealthy and well educated parents, there is a 85.3% chance that the child will receive admission to a university and then find more stable and well-paying jobs than a child that is not. Conversely, if a person is born into a financially unstable family, there is a higher chance that the person will either not attend university, or receive admission to a non-prestigious university. According to the KBS Lecture Program ‘The Brave Talk Show’ 95% of these non-prestigious universities’ rely upon tuition money. Thus, to stay afloat, their main priority is to charge as much tuition as possible. Therefore, students who enter university without the proper financial mean, graduate with a mountain of student loans to pay. This in turn widens the gap between them and their more well to do counterparts. “In order to reduce the discrepancy between the haves and have not’s, much needs to be done by all parties involved, including the government, universities, parents and students themselves,” said Professor Jeong whom teaches public administration in Kyongpook National University. One main concern that the younger generation faces in our contemporary society is unemployment. Due to the fact that South Korea’s financial development rate has fallen into the 2% range, many corporations in South Korea are offering less employment for the younger generation. In addition there are other factors that are complicating matters including, the overinflated price for buying a house, (particularly in the nation’s capital), growing debt that includes loans taken out to cover college tuition and so on. For HYU students, for instance, many have had a hard time covering their living expenses. Many HYU students come from other providences, which mean that they need a stable place to stay when they come to Seoul for their studies. The problem is, is that HYU’s dorm facilities can only hold up to 19.8% of students who have come from other providences. The other 80.2% are forced to find privately owned rooms that are located near HYU. For HYU students to rent a room like such, they have to pay at least a 500,000 Won rent plus a 1,000,000 Won deposit. And that is for just one room with failing facilities. “I live in a one room with my sister and pay a 570,000 Won rent which is a complete rip-off in my opinion. The facilities are okay compared to other places, but there aren’t many accommodations surrounding the room. I have wished, on numerous occasions, that there would at least be a mini-mart in the near vicinity,” said Jeong a freshman who majors in English Literature. Overly expensive living prices are not a problem that is just confined to HYU. In truth, many university students all face the same problem. Some students who have wealthy parents do not have to worry about covering the rent, but the majority who doesn’t have to work themselves to pay off their living expenses. Taking into consideration that university students make at least 6,030 Won an hour during their part time jobs, most need to work at least half of the day to pay off the rent. In the end, their home which is supposed to provide them with comfort and relaxation, is becoming a complete nuisance and burden to many Korean university students. Thus, in response to such financial obstacles, more and more university graduates are looking for stable and well-paying jobs. The problem, here is an oversupply of people wanting the same safe jobs and not many are willing to settle for anything less. To address the current unemployment situation, the government has decided to implement an unemployment plan based on their assessment of the overall financial environment. “In order to make the plan effective, the government will conduct a thorough evaluation of different organizations and assesses the immediate reaction from the public,” said Professor Jeong. However many financial experts fear that the plan will be ineffective if changes are not made in the current economic circumstance. In other words, the government needs to first focus on the fundamental cause of the rising unemployment rate, before initiating any strategies that may actually exacerbate matters. Korean politics is dynamic, and its politicians are very active. However, among the things that are lacking is a proper representation of the younger generation, who understandably lack trust in the current administration due to thoughtless politicians like Na Hyan-wook and others like him such a former mayor of the Gyeongnam Providence, Hong Joonpyeo referred protestors, who had engaged in a hunger strike to demand his resignation and apology for other inconsiderate sayings, to “trash deciding not to eat” and the chairman of the Board of Educational Scholarship Ahn Yang-oak who said in an official press meeting that “university students need to have debt.” These shocking statements only serve to further the feelings of mistrust by many university students nationwide. Another political issue that many citizens face in South Korea is the manipulation of the mass media. News outlets have the responsibility to deliver correct information about current issues to the public. However, many news agencies have been providing politically biased news. For instance, recently during the student demonstration against the Ewha Womans University president, many news outlets failed to mention the fact that many students were physically removed from the premise; some even hurt in the process. “It’s really a disappointment. Many students are fighting peacefully for a cause, but because the public is not getting the correct information from the news, we are being viewed as just an annoyance,” said a Junior from Ewha Womans University that majors in Public Relations. 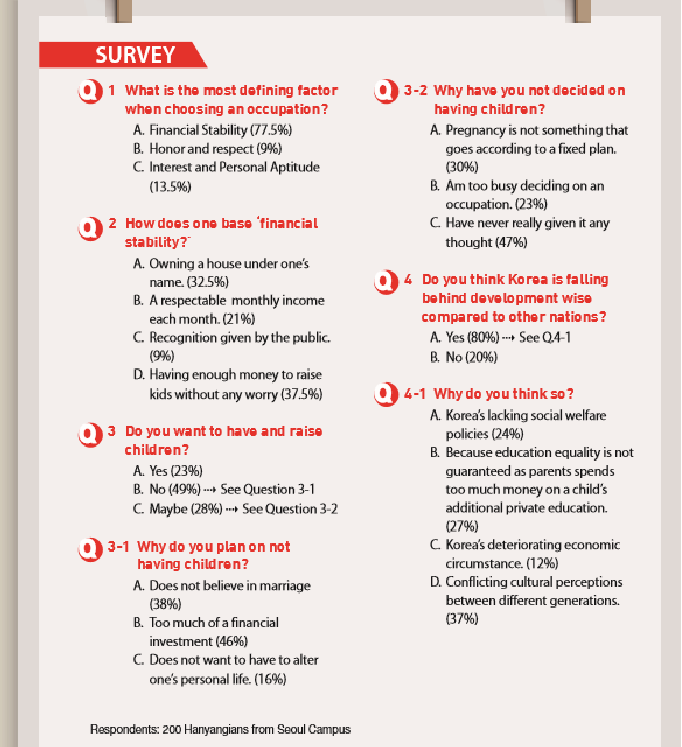 Problems such as those mentioned above are some of the main causes pushing the younger generation towards choosing to live in another country. In the past, many Koreans assumed that one needs to live in a particular country in order to adopt love and trust for that country. Thus, many believed that leaving Korea, for example, would mean giving up any love that the leaving person had for Korea. In the past, there were many people who had chosen not to live abroad because they never really want to wipe away their roots and patriotism they still have towards that country. However the picture is very different today. “I was looking for a better life here in America. That doesn’t mean that I’m an American. I’m still Korean. I still get worried whenever something happens in Korea, and I still root for Korean teams in world-wide sport events,” said Kang, a 21-yearold university student who chose to continue his education in America. Leaving the country is now less dramatic and more realistic as the concept of patriotism shifts. As a result, more young people will likely look to life in another country as an alternative to the harsh reality of Korean life. Every nation has its problems and no matter where a person decides to flee, there will likely always continue to be financial, politic, and/or social problems concerns. Therefore, avoiding issues and obstacles many not actually be the most suitable alternative. Instead, there is something to be said of perseverance, determination and dedication. Meanwhile, the South Korean government should also recognize it’s crucial role in building and maintainimg trust with the public. By working together can problems and issues truly be solved, and in a manner that benefits everyone.